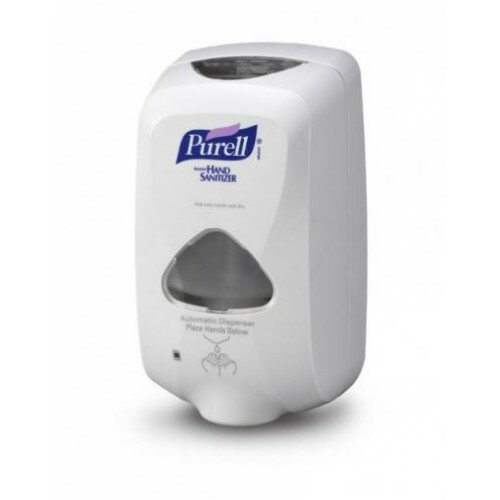 Touch-free, trouble-free dispensing system for PURELL Instant Hand Sanitizer (Foam or Gel ). Holds one large 1,200 ml refill. Dispenser features a skylight with an extra large window that makes it easy to see when it's time to reload. Fully ADA compliant. 30,000 uses from three standard C-size alkaline batteries (included). UL/CE registered. The power of PURELL, America's #1 instant hand sanitizer, in a non-aerosol foaming formula. Kills 99.99% of most common germs that may cause illness. Thick, rich foam formula stays on your hand. Patent-pending 62% ethyl alcohol formula is free of fluorinated chemicals. Contains moisturizers to help keep skin hydrated. Battery Performance: The Touch Free Foam Dispenser will run for 30,000 applications on three C sized alkaline batteries. The blinking LED on the dispenser cover shuts off when it's time for fresh batteries. Batteries are included with the dispenser. Portion Controlled Dispensing: The Touch Free Foam Dispenser system delivers a consistent amount of product with each activation. Touch Free dispensers also help manage costs because they reduce the likelihood that a person will pump the dispenser multiple times when they dispense product into their hand. Delay Between Actuation: The system requires that a person removes their hand from the actuation zone and then bring it back under again for a second dispense. This design helps reduce the cost of operating the system and it also reduces the risk of accidental dispensing of the product. Touch Free Purell Foam Sanitizer will deliver 4,000 applications of instant hand sanitizer per case. Touch Free Purell Gel Sanitizer will deliver 4,800 applications of instant hand sanitizer per case.